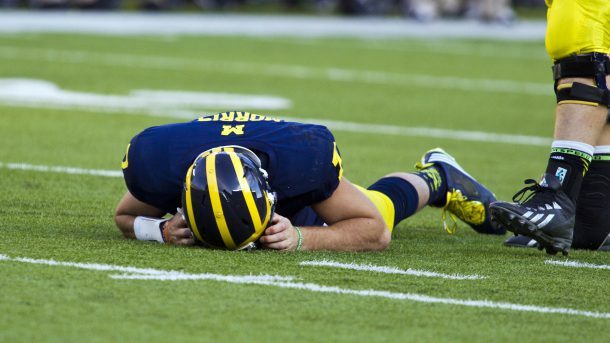 Genomics, Medicine, and Pseudoscience: Will this be the end of college football? The risk of brain damage is startlingly high. Will this be the end of college football? The risk of brain damage is startlingly high. Parents send their kids off to college with high hopes and great expectations. Universities, in turn, have a responsibility to provide an education in an environment that supports and also challenges the students. Universities are not supposed to encourage activities that may result in permanent brain damage. And yet, they do. As revealed in a new report by Jesse Mez and colleagues from Boston University, just published in the Journal of the American Medical Association, a shockingly high number of former football players, from both college and professional teams, suffered chronic traumatic encephalopathy (CTE) later in life, likely as a result of their years playing football. The study authors looked at 202 deceased former football players whose brains had been donated for research, and found that 87% of them had some degree of CTE. The highest rates of CTE were among former NFL players, which affected 110 out of 111 players. CTE was nearly as bad in college football players, though, with 91% of them (48 out of 53) suffering from CTE. "There is substantial evidence that CTE is a progressive, neurodegenerative disease." In other words, CTE is a death sentence. The authors of the study stated their conclusions carefully, noting that the study was not randomized, and that players and their families may have been motivated to participate because they were concerned about a possible link between football and CTE. Nonetheless, even if the risk of CTE is much lower than found in this study, universities should be taking a very hard look at the risks that they are exposing their students to. Or to put it another way, is it okay to ask young men to play football if the risk of permanent brain damage is only 50%? What if it's just 10 or 20%? Is that okay? Is football that important? Readers of this column know my answer: no. College is not about football, and if it disappears completely, universities will be just fine. The University of Chicago eliminated its football program in 1939, and brought it back in decades later as much-reduced program, now in NCAA Division III. The university itself has remained a powerhouse, routinely ranked in the top universities in the country academically. As I've written before, football is corrupting our universities, blinding them to their true mission (education and research) in the pursuit of a profitable entertainment business. University presidents seem helpless to stop or even slow down the enormous machine that is big-time college football. For example, in 2015 the University of Maryland (where I used to be a professor) paid millions of dollars to buy out the football coach, so that he could quit a year early and the university could pay millions more to a new coach. Ironically, Maryland had done exactly the same thing in 2011 to buy out the previous coach, at a time when the entire state had hiring and salary freezes in place. None of these actions benefitted the university or its students. "Look, football and school don't go together. They just don't.... No one in their right mind should have a football player's schedule, and go to school." Universities now face an ethical dilemma far more serious than merely taking advantage of athletes' skills to entertain football fans and pay inflated salaries to coaches. The JAMA study reveals that by running a football program, universities are not just robbing young men of four years that might be better spent getting an education and preparing for life: they might be robbing their students of life itself.